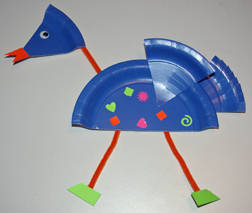 Let kids explore their creativity and create an entire flock of birds using paper plates, pipe cleaners, cardstock scraps and paper punches. I saw this idea in Woman’s World magazine. What You Need: 1 sturdy, colored paper plate (we used dessert size);Â 1 or 2 pipe cleaners; cardstock scraps; paper punches; googly eye; glue and/or tape. How to Make It: Cut paper plate in half and then cut one of the halves into three triangles. Use scissors to make “fringe” for tailfeathers and wing. Tape pipe cleaners (however long you’d like your bird’s legs and neck to be) as shown. Bend them if you want, for crooked neck or legs. Tape paper plate triangle to top of neck and add beak cut from cardstock. Glue on plastic eye. Cut feet and tape to legs. Punch out shapes and glue to body. Dessert-size paper plates are the perfect size to make masks for little preschool faces. Don’t limit kids to lions; set out a variety of supplies (yarn, paint, etc.) and let their creativity go wild. What You Need: dessert-size paper plate; yellow crepe paper; black marker; 3 orange pipe cleaners; transparent tape; scissors. How to Make It: First adult must cut out triangles for eyes and nose and cut pipe cleaners in half. Cut crepe paper into eight strips about 5 inches long. Tape to back (curved size) of paper plate. Draw around eye holes with black marker. Tape three pipe cleaners to each side for whiskers.